We all have that person (or ten) on our buddy lists that insist on having their IM text formatted in stupendously obnoxious ways. Maybe it’s just using tiny font sizes, but sometimes it’s a full fledged assault on your eyes with bright pink size 26 Comic Sans font clashing against a neon yellow background in a way that makes your eyes want to bleed. The culprit of this is often Windows IM clients and their accompanying themes, but given how easy it is to customize the fonts of nearly any messaging client there’s no single source to blame. If you’re like me, you hate this stuff, so what should you do? 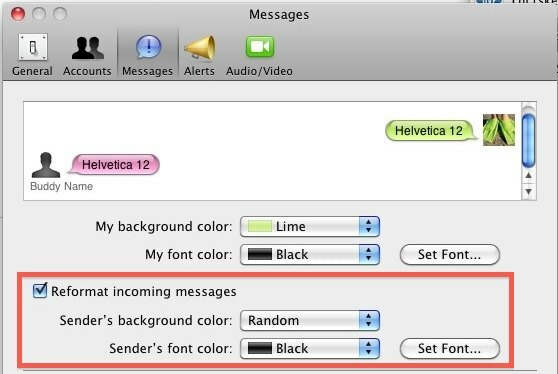 Set iChat to automatically reformat all incoming instant messages! You can set all messages to be a uniform font, size, color, and background, guaranteeing that you’ll be able to keep a simple and easy to read instant message conversation despite whatever disaster is lurking on the other users UI end. Changes take effect immediately so you can test out what other fonts look like. I’d recommend something easy to read for sanities sake. If you enjoyed this tip, check out some more iChat tips and tricks. This is definitely a useful tip! People with a weird font fetish deserve to be reformatted. « iPhone Mini: Half Size, Edge-to-Edge Screen, Wireless Syncing, Free With Contract?